In this update, we are excited to bring you Part II of the Summer Festival! In this half, we are introducing new partners, new dungeons, and new Magatama options for Kaguya! We have updated our Summer Website with a summary of the new content being added! Genbu and Ibaraki - Summer Sky have been added in this update as partner characters! You can obtain Genbu through the Platinum tier of the Special Gacha and Ibaraki - Summer Sky in the gold tier of various gachas. Please read our Nyankoropon section for more information. 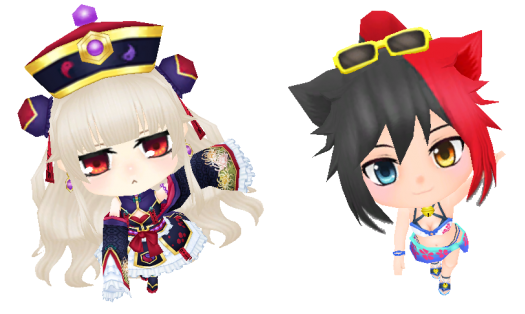 We have also released mini character accessories for the new partners! You can find Genbu's mini character accessory in the gold tier of the new gachas, and you can get Ibaraki - Summer Sky's through her item exchange after advancing the new event quest! 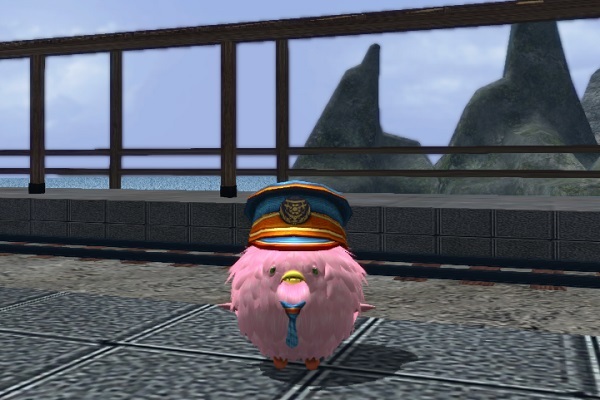 In order to access the summer event quests (both Part I and Part II), you must first talk to the NPC Popogorou in Onigashima to head to the Summer Festival Event Grounds. Afterwards, please talk to Sarutobi Sasuke in order to access Part II of the quests! If you have already talked to her before, you can talk to Houou to quickly warp to the event dungeons. In this part, an item exchange store with Ibaraki Douji has been added, as well as a treasure chest Nyankoropon with Genbu. Please note that there are other rare items in this exchange too! And many more rare materials! 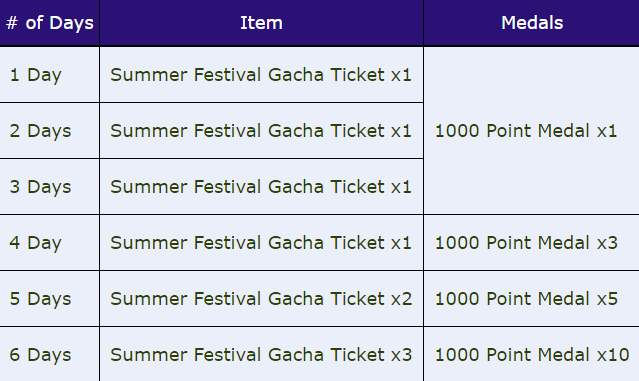 Additionally, we have added New Event Achievements for part II of the summer fest! 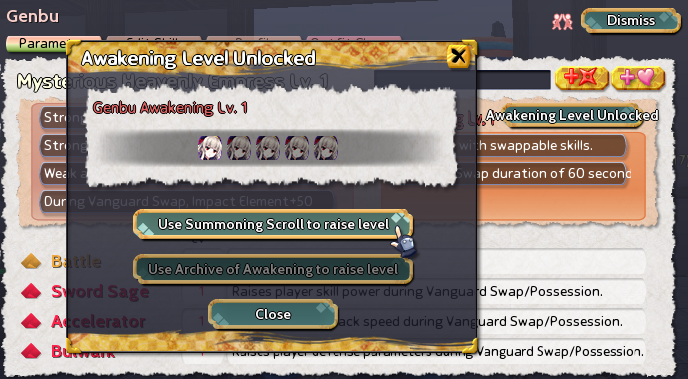 You can collect Articles of Awakening Scrap - Vanguard through some of them, so please be sure not to miss out! This event will last until 10/22 before maintenance. Inuchiyo has an all new login bonus calendar for you! In this calendar you will be able to get the “Archive Pages” needed to level up your partner characters’ awakening level. You will also receive the latest Gacha Ticket, so don’t forget to log in! 10/2 ~ 10/22 before maintenance. 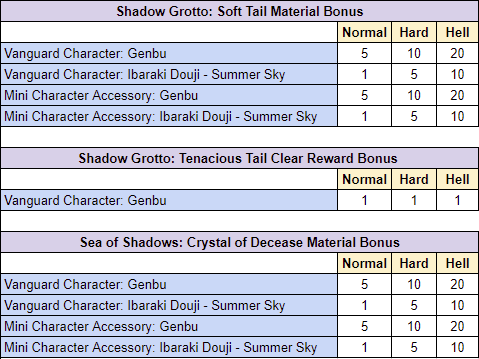 Additionally, if you have the Ibaraki Douji - Summer Sky or Genbu mini character accessories equipped, material items will have a bonus attached to them. We have also added the dungeons Shadow Grotto (Genbu) and Sea of Shadows (Genbu) that you can access by talking to Houou after completing all of the Part II quests! In these dungeons, Genbu is automatically summoned as your partner, and they layout is the same as the regular version of the dungeons. You can challenge these dungeons 1 time per day. Specifically in these dungeons, Genbu's offense and defense will be increased, and the Vanguard Gauge will be raised faster than usual. All of her skills and abilities will be at their maximum power. When you Vanguard Swap with her, the maximum duration will be increased to 3 minutes. Also please note, if you fall off the Sea of Shadows stage, you will die and need to revive. There are some enemy attacks that can knock you back, so please be careful! Please note that the achievements between the Genbu dungeons and the regular Shadow Grotto and Sea of Shadows dungeons are different! However, you have a higher chance of earning more rewards in the Genbu dungeons because they are more difficult. Additionally, we have added a new dungeon boost campaign! If you talk to Chifuri, you will notice that the Wardings Eldritch Beast and Hades Elios now will reward you with increased materials if you clear them with a rank B or higher. Select them under "Limited Time Dungeons". We have added many new gachas in this update! You will now be able to use the Sunset Gacha Tickets that you collected in the first part of the update! Genbu has been added to the Platinum Tier of the Special Gacha, and we have more units than ever before in celebration of the summer festival. - Unit 01: Maeda Toshiie and Ono no Komachi + a Platinum Gacha Ticket in the platinum tier, and Genbu's mini character accessory as well as Ibaraki Douji - Summer Sky + a SP Gacha Ticket in the gold tier! - Unit 1 (Genbu Limited Nyankoropon): Genbu, Maeda Toshiie, and Ono no Komachi are in the Platinum Tier with their win rates increased! In the Gold tier, Ibaraki Douji - Summer Sky and the following mini character accessories are available with their win rates increased: Genbu, Hoouoou, Inucho, Tosheeay, Keering. Do not miss your chance to obtain these rare scrolls and accessories! 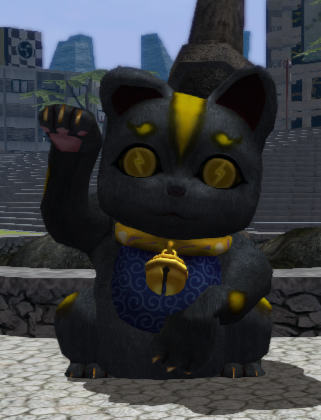 - Unit 2 (Genbu Limited Spin Discount Nyankorpon): Contains everything listed above, but is discounted to only 120 OC for 5 spins for the first 25 spins! - Units 3 & 4 (Genbu Premium Nyankoropon): These Nyankoropon contain Genbu and previously released partners and mounts. The Gold tier contains Ibaraki Douji - Summer Sky, Tristan, and fan-favorite outfits like the Inari ones! The Premium Nyankoropon can only be spun with a Premium Gacha Ticket and not OC, but these gacha only contain platinum, gold, and silver tiers, so your chance of obtaining a partner is much higher than other tiers. 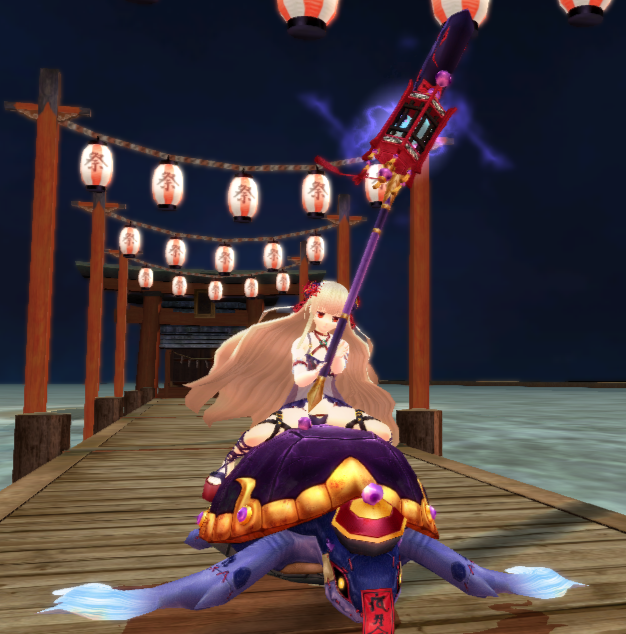 - Unit 5 (Sunset Nyankoropon): Using the Sunset Gacha Tickets you have obtained from achievements or exchanged from Sasuke's item shop, you can spin for previously released partners and mounts in the Platinum tier, as well as Ibaraki Douji - Summer Sky and the Gembu accessory in the gold tier. Please note that this gacha cannot be spun with OC--only from Sunset Gacha Tickets obtained from this event. - Unit 6 (Sunset Premium Nyankoropon): This contains all of the contents as Unit 5 (listed above), but features also features Genbu in the Premium Tier! You can only spin this with a Sunset Premium Gacha Ticket. 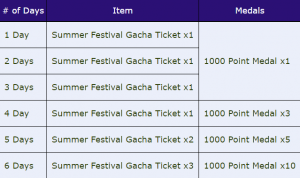 You can get these tickets by playing through the event, and also in our latest Summer Festival OC Campaign! - Units 7 - 12 (Pick-up Legendary Nyankoropon): These Nyankoropon contain only platinum tiers with previously released partners and mounts! So your chance of winning a partner scroll is 100%. Please note that you may only spin these units with a Pick-up Lengendary Gacha Ticket. - Units: 13 - 14 (Legendary Nyankoropon): These tiers contain previously released partner characters and mounts. Your chance of obtaining a partner is 100% because there is only the platinum tier. 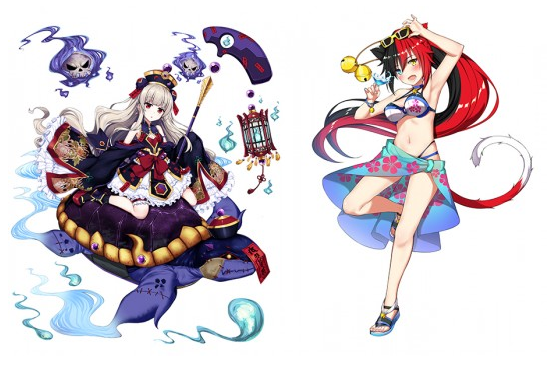 Please note that these units can only be spun with a Legendary Gacha Ticket and not OC. 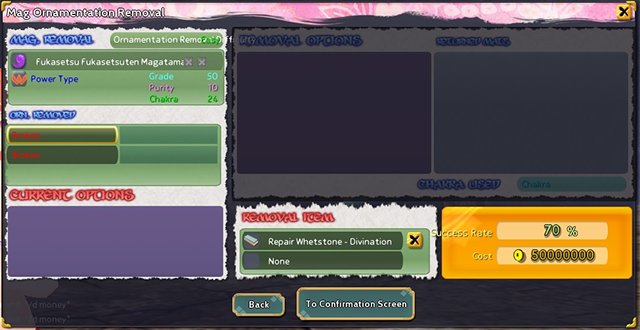 We realize that this Nyankoropon contains a lot of content, so if you need any information on how to obtain these tickets, please contact us. Most tickets can be obtained from completing event quests and collecting materils that can be used in the Yorozu Exchange in Onigashima, as well as the newly added exchange shop that Ibaraki Douji has in Part II of the event. - Partner/Mount Scroll: 170 Yorozu Limited Tickets (please note that Genbu, Maeda Toshiie, and Ibaraki Douji - Summer Sky have been added to the exchange in this update)! 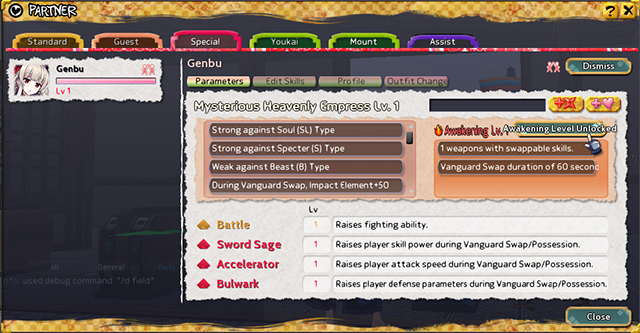 *Please note that the Articles of Awakening for Vanguard, Mounts, and Assist Characters are all separate items. 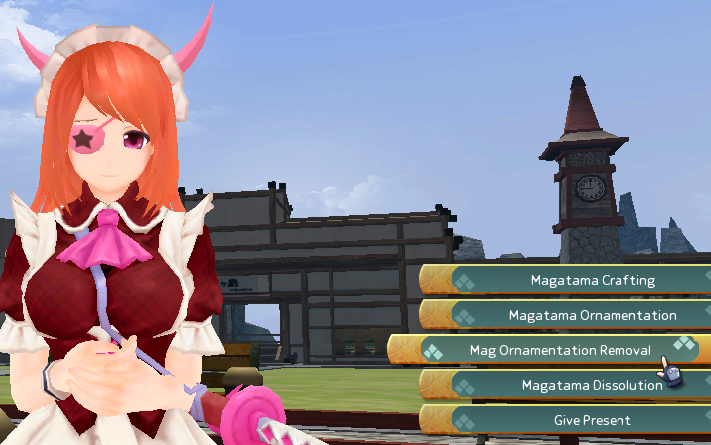 Please note that you first must have completed her Magatama Ornamentation Quest in order to access this feature, then talk to her in a town or field to access these options. - The dungeon boost campaign is now over. - We have fixed the descriptions of all partners so they display correctly now. - The Vanguard Swap time for the partner Sarutobi Sasuke - Sailor has now been extended to its correct time.